Specialists in prestige, performance and care. For many years now, Blenhiem has been an independent performance and prestige vehicle specialist. All our vehicles are prepared to an 82 point RAC standard, come with 12 months breakdown cover and a 6 months warranty as standard. Straight forward finance for your vehicle. Blenheim Cars is an approved FCA dealer which means we can offer a wide range of finance products such as HP PCP. We're approved by the RAC meaning peace of mind comes as standard. 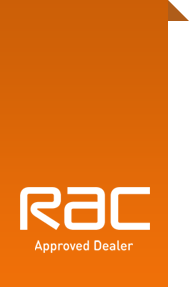 All RAC Approved vehicles come with a 6 month RAC warranty as standard for peace of mind. Vehicle based breakdown including Roadside, Recovery and At Home aswell as RAC Avcident Care. Ensures the vehicle you are buying isn't stolen, written off or has outstanding finance on it. Exceptional customer service that’s second to none. A bit about us and our services. Based in Standlake near Witney in Oxfordshire, we are an independent family owned business. We supply quality previously owned vehicles to local, national and international customers and have a comprehensive selection of prestige, performance, hatchback, 4x4 and family vehicles in stock including, petrol and diesel. We also have full service facilities for all makes and models of vehicles including most vans. Our trained and highly experienced technicians meet rigorous standards for quality and offer computerised diagnostics and MOTs, including a free re-test within seven days, should your vehicle fail. At Blenheim we take pride in our customer service standards and our qualified team guarantees to offer you a courteous and prompt service. Our aim has always been to build our reputation through word of mouth and retain your custom by offering the highest of standards. We accept all major debit and credit cards and work with lenders such as Close Motor Finance to arrange finance facilities, if required. There will be a £180 plus VAT admin fee added to any finance arranged with an external lender that we have not arranged ourselves. Does your car need a service or MOT? No matter your make or model, we have a full service facility and highly skilled technicians at the ready for all your need. Looking to lease a new car, we offer great rates for personal car leasing. Hire one of our clean and regularly maintained vehicles. Looking to sell your car or trade it in?